Shucking oysters is a hard task that yields delicious results. For some people, raw oysters are a unique delicacy and since the work of shucking oysters is time-consuming and practiced skill, it may be best left to the professionals at a restaurant or raw bar. An easier method to prepare oysters at home is to grill them on an outdoor grill. While there is a slight risk of an oyster exploding on the grill, a grill lid and a word of caution can usually prevent any mishaps. Grilled oysters are easy to eat and the grill imparts a lightly smoked flavor to the oyster. This method works with any type of oyster but super small Olympias, Kumamotos, or other Pacific oysters can get lost through the cooking grate. If you are planning on grilling particularly small oysters, it's best to place a piece of foil with a few holes punched in on the grill. This will prevent losing the oysters in the grill grate. 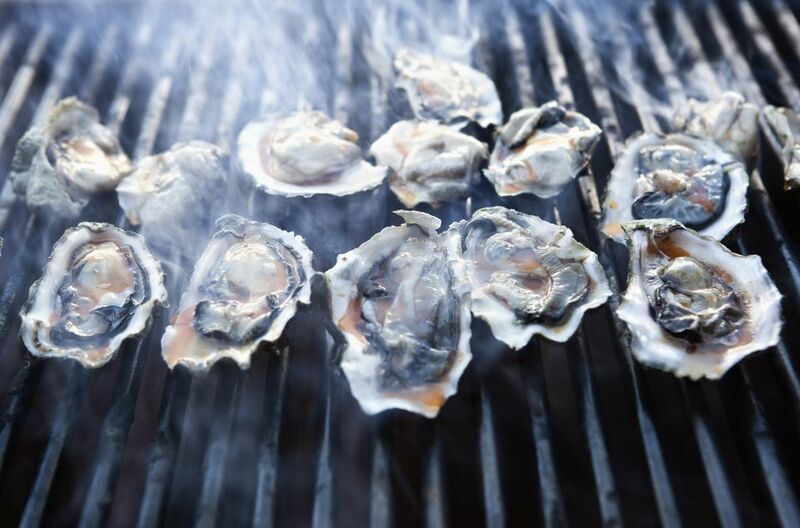 Start with a hot gas or charcoal grill (you should be able to hold your hand about an inch above the cooking grate for just a few seconds before pulling it away from the heat) and fresh oysters. Set the oysters cupped side-down on the cooking grate or foil if you are using. Cover the grill and cook until the oysters have opened their shells and are opaque and cooked through but not yet dried out. This will take about 5 minutes for smaller oysters and a few more minutes for larger ones. Note that most cooked oysters will open their shells only a bit. It will be easy to lift off the top shell but they don't actively open up the way cooked mussels and clams do. Use tongs or heavy-duty oven/grilling mitts to remove the oysters from the grill. Remove the top shell (it will be very hot) and, for easy eating, run a sharp knife along the inside of the bottom shell to loosen the oyster from the shell. If you want to sauce the oysters while they're on the grill, you'll likely need to remove them, take off the top shells, put them back on the grill, and then sauce them. It's a bit more of a hassle, but for the result of deliciously grilled oysters, it's worth it! Serve the oysters hot or warm. You can top them with a bit of butter, compound butter, a favorite barbeque sauce, or something tasty and a bit different like a dollop of pesto. If you are adding a sauce, make sure to provide napkins, as these are juicy treats. Do caution your diners that the shells can be very hot, especially if you are serving them directly off the grill.